The 2015 Single A Fall Championship game featured the Royals and the Lookouts, both high scoring offenses with solid defenses. The weather was perfect for a fun day of baseball, and both squads came ready to battle. In 2 regular season games this fall, the Royals led in both games early until the Lookouts rallied late both times to sweep the season series. Both squads would be playing short-staffed, with the Lookouts missing their top hitter and starting catcher and having only 8 men, while the Royals were missing their leadoff hitter and starting pitcher. With both teams eyeing their first championship, today’s game would have a lot at stake. The Royals led off the top of the first with Phil Acosta reaching on an error. Rick Valdez walked, and after both men moved up on a passed ball, league batting champion Stephan Ohayon singled home the pair, giving the Royals an early 2-0 lead. Back came the Lookouts in the bottom of the inning. With 1 out, Isaac Axelrod reached on an error, and Michael Craig doubled him home. Craig would get caught stealing on a controversial call at third to end the inning, with the Royals holding a 2-1 lead. Both Royals’ starter Daniel Kahn and Lookout’s starter Evan Haskell pitched quietly through the second inning, combining for 25 pitches and 3 strikeouts in the frame. Leading off the 3rd inning, the Royals’ Phil Acosta walked, and 2 pitches later, scored on a Rick Valdez home run to deep right. The Royals now held a 4-1 lead. In the bottom of the 4th, the Lookouts would make their move. With 1 out, Michael Craig reached on a fielder’s choice. David Langstaff doubled to deep center, but Jason Bolding hit cutoff man Eric Walbridge with a perfect throw, who delivered a strike to catcher Rick Valdez to cut down Craig at the plate. But after Travis Samuel reached on an error, Evan Haskell doubled him home, David Rocha singled home another, and Matt Stock singled home another, tying the game at 4. It would have been even worse if not for some good acting from first baseman/cut-off man Mike Miller, who tricked the runner on 3rd to run into the 3rd out with a pseudo-hidden ball trick. The Royals responded immediately in the top of the 5th. Dennis King led off with a walk, then took second on a passed ball, scoring one pitch later on a ground-out/errant throw off the bat of Phil Acosta. Rick Valdez walked, and pinch runner Acosta swiped second. Stephan Ohayon singled him home, giving the Royals a short-lived 6-4 lead. The momentum would shift towards the Lookouts in the bottom of the frame. After 2 quick outs, manager Isaac Axelrod walked, and with a full count, Michael Craig doubled him home. David Langstaff popped up to the infield, but the ball dropped. Instead of ending the inning, the Lookouts would be given new life and took full advantage. Travis Samuel walked to load the bases, chasing starter Daniel Kahn. 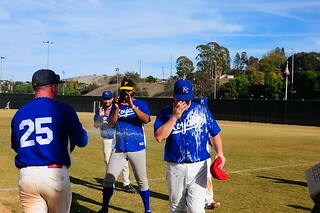 Michael Schofield entered for the Royals, and with a 1-2 count, gave up a grand slam to Evan Haskell. The Lookouts now led after 5 innings – 9-6. The Royals offense wouldn’t give in, and manager Mike Miller took over in the top of the 6th. 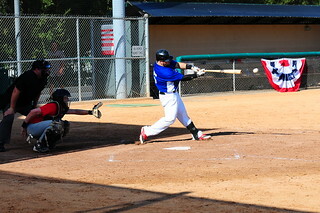 After he singled to right, he took both second and third on passed balls, then scored on a balk, cutting the lead to 9-7. 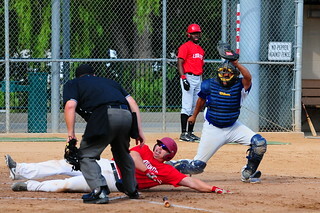 But the Lookouts still had the momentum. 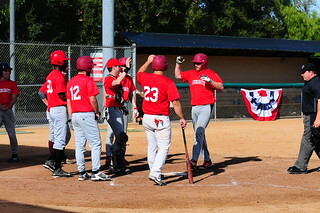 Matt Stock led off the bottom of the inning with a walk, and after back-to-back singles from Matt Meyerowitz and Isaac Axelrod, Michael Craig drove in 2 with a single of his own. Back-to-back errors led to another run, and the Lookouts had a solid 12-7 lead after 6. With only 9 outs to go, the Royals knew they’d need to score some runs fast. After 2 quick outs, Stephan Ohayon doubled to left-center. League MVP Eric Walbridge singled him home, and Ryan Elliott singled to put men on the corners. Mike Miller hit an opposite-field single to plate Walbridge, and Jason Bolding reached on an error to plate another, cutting the lead to 12-10. 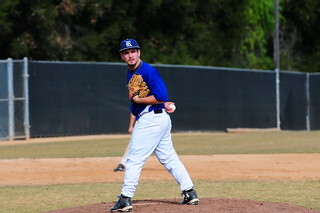 Schofield finally calmed down on the mound, working a quiet bottom of the 7th. With 2 outs in the top of the 8th, Rick Valdez walked, and pinch runner Phil Acosta scored from first on Stephan Ohayon’s fourth hit of the day – another double to left-center, cutting the lead to 12-11. Another quiet inning from Schofield, and the Royals entered the top of the 9th trailing 12-11. The Royals would turn to a few veterans to stave off another heartbreaking championship loss. Mike Miller led off the inning with an infield single – his third hit of the day. 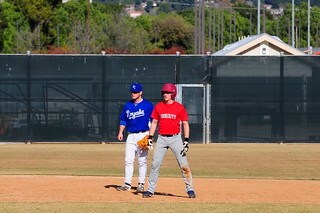 He made way for the fresh legs of Daniel Kahn, who narrowly swiped second on a ball in the dirt. That brought up Jason Bolding, who was hitless in 4 at bats. Bolding worked the count to 1 ball, 2 strikes, before blasting a double to the wall in center to tie the game. 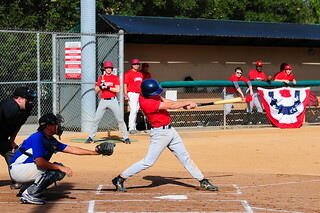 With 2 outs, Dennis King II came up with his biggest at bat as a Royal – hitting a ground ball up the middle that was booted by the second baseman, allowing Bolding to score the go ahead run. 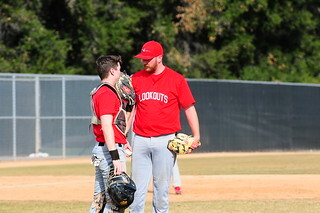 Unfortunately for the Lookouts, Michael Schofield was locked in, striking out the side in the bottom of the 9th and ending the Royals' 13 year PCBL championship draught. 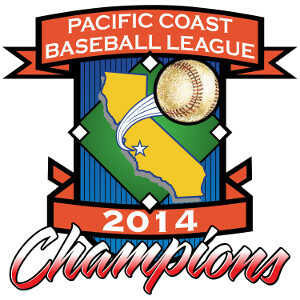 Congrats go out to the Lookouts on a great season, and an amazing championship game. With a full squad (or at least 9 players), the results would likely have been very different. But this day belonged to the Royals – after 406 games over 26 seasons in the league, they finally brought home the trophy! 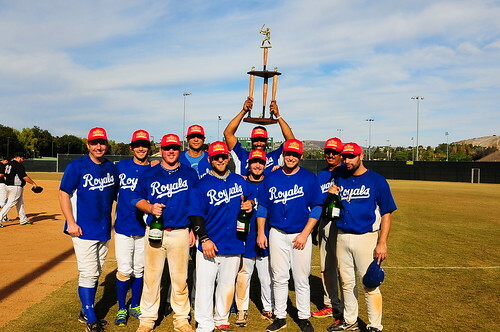 Congratulations to the 2015 A-Division Champion Royals!